Let me preface this by saying that I'm really pleased with how the cabling is progressing. I think that the final product -- assuming that it fits -- is going to be really nice. But seriously, the cables. Cables, cables, cables. Cables are no more boring than straight knitting, but they require so much more attention. It's hard to multi-task while cabling -- any attempts to watch TV or carry on a conversation lead to errors, ripping and frustration. I don't mind giving this project the necessary attention, but I've found myself craving mindless knitting. I made a deal with myself that once I finished the back (pictured above), I could start something new and blissfully mindless. Stay tuned for those pictures soon! Boogie likes the cables because I sit still for once! What a fabulously sweet picture of you and Boogie! I miss having a cat when I see things like this image. Your cabling is beautiful; I've been doing enough colorwork this year to be starting to crave some crunchy cables...mine, of course, will be Dachshund con Cables. Boogie is a beanbag kitty! What a cute picture. And the jacket looks great! Oh, can't wait to see it in (or on?) the flesh! Very pretty. Oh girl, lo siento. I know how you feel. When ever I work on my cable cardigen (as lovely as it is) I just begin to crave the mindless stuff. ::squints:: Is that a kitty I spy? For a few moments, I thought that was a small black blanky*. Heh. I love Boogie -- what a super lap cat! 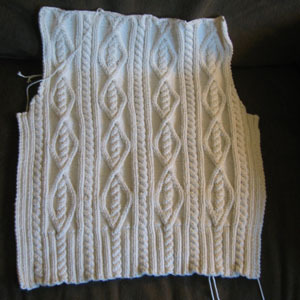 Great cables -- I am looking forward to seeing the finished product. 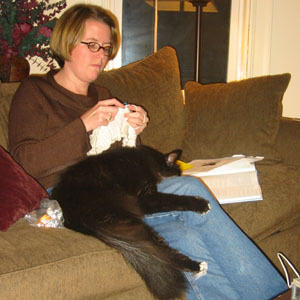 Amy -- a project with cables has a way of taking over the couch, doesn't it? This particular pattern often requires that I be able to see *3* pages of the pattern at once. First, there's the page with the instructions for the panel on it, but within each row on that page it says "follow Row 20 of cable sequence", which of course is on a second page. And *then*, the cable sequence has rows that say "As Row 4", which is NATURALLY on yet another page since the cabling instructions are spread over two pages. It's enough to make me put my eye out with a cabling needle, really.